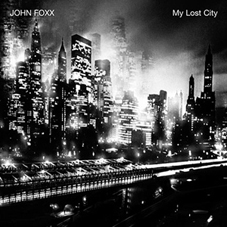 My Lost City continues John Foxx's obsession with overgrown, abandoned Ballardian cities and takes a look back at long lost times and places. The album begins with an eight-minute epic, "Imperfect Hymn", which heavily echoes "The Garden" and the sound and style that would become Cathedral Oceans. Led by an unusually high choral-style vocal from Foxx, this haunting track brings images to mind of long forgotten places, slowly ravaged by time and the kind of imagery that would later adorn the Cathedral Oceans albums. Foxx's nostalgic and insightful sleevenotes indicate that these pieces were recorded as far back as the early 80s in his Garden studio - which, although no longer owned by Foxx, still resides on Holywell Lane, in London, which is the title of the album's second track - a simple and melodic piano piece. My Lost City brings to mind the pieces and imagery in the Church booklet that came with The Garden. In fact, the closing notes of "The Garden" come to mind on tracks such as "Imperfect Hymn" and "Hidden Assembly", as this album suddenly starts to fall into place. There is a very dramatic and cinematic feel to some of these pieces, despite being generally a lot darker and more sombre than Cathedral Oceans. Foxx's fascination with vocal resonance and architecture combined with his experience of singing in a choir during his youth, come into play on several tracks, such as "Barbican Brakhage" and "Hawksmoor Orbital" which have choral/latin vocals over moving church organ music. There's no denying that many these songs are an embryonic form of Cathedral Oceans, and some pieces are recognisable from the much-bootlegged Shrewsbury 1988 recording of one of the first Cathedral Oceans performances. The album closes with the emotive "Scene 27 - Intro To The Voice Behind The Wallpaper, Trellick Tower, 3am" - which ends the album on an uplifting and moving note but also takes the prize for longest John Foxx song title to date! My Lost City also features the stunning photograph that had previously been considered for the artwork to The Pleasures of Electricity and as-yet unreleased album, Urban Motets. My Lost City is an album drenched with emotion, although it doesn't reflect the towering cityscape as depicted on the sleeve, but perhaps the history beneath that modern city. It does however, feel like a journey through the past; burrowing through the layers of time - which is in fact, not far from the truth. The age of these tracks account for the little imperfections in the sound quality now and again, but this adds even more character to the music, as these long-gestating pieces have finally been allowed to see daylight.